Need to buy best youth catcher’s mitt for your kid? Here are a few things you need to know before you buy. Young players are energetic when they are on the baseball ground. Their passion is boosted when they play well and that need some extraordinary accessories to be there with your young player. Though, most of the players on the ground have to a player like a cheetah in the jungle as they should never miss the target in any way. But when we are talking about giving a catcher the opportunity to play well, we are actually supporting the backbone of the team. There is no team that can ever win without having a pro catcher in the team. Having a good catcher that communicates well with the pitcher and has the understanding of the actions he has to take is the main necessity for a sure win in the game. So, to help your young catcher play with confidence and to help him play like a pro with ease, you have to give him the best catcher’s mitt. A perfect catcher’s mitt is as important to the catcher as the catcher is to the baseball team. So you need to make sure it fulfill all the requirements for a catcher to catch the ball precisely. What is a Catcher’s Mitt? A catcher’s mitt is definitely a different kind of mitts as compared to the gloves and mitts used by other field players. It is therefore defined as a mitt having a stiff structure made of leather with heavy padding on the palm to neutralize the stinging feel of the ball when the pitcher throws it with its full force. Further, the Mitt is given a claw like a shape and structure to make sure the catcher would not miss the ball in any way. These mitts are fingerless and are designed to capture the ball quickly and keep it in hand without losing it. It is for sure an important thing to know that when you need to buy a perfectly sized catcher’s mitt, you need to go for the size of the circumference and not just the length of it. For kids, around 12 years of age may need to look for a 32 inches mitt, whereas for kids or young player having the age of 13 years or more may need to compare 32.5 inches or more than that depending on the requirements. Better size choice means you will have a better-fitted mitt to allow an increase in the visibility and catching capability with more precision and accuracy. Whereas if you choose a bigger one you may have to manage it more though having more space of the pocket to catch the ball. The materials that are used in making the mitts plays an important role in determining the ease of use and the ability to make the glove comfortable for the user. You can find softened leather mitts, pure leather and steer hide l﻿﻿eather mitts that would work best for the Mitt to be perfect. One thing you should be sure enough is that the Mitt has to be durable and made of good leather as it needs to withstand high-pressure catches. For perfect sizes Mitt there should always be a closed webbing on it as it will add to the area that will cover the ball and catch it easily. While if you are using a large mitt, an open webbing would work to see the ball correctly. The back of the mitt would be closed in most cases. But if you need more maneuverability, you can go for open back mitts but always need to pick the right fit or you can get it with perfectly structured lacing to let you fit your hands in for precise catches. The padding on the palm or in the pocket is a necessary feature to see so that you know that the hands of the catcher would be safe and the speed and pressure of the ball would be neutralized without hurting the hands. The break in time also matters for making sure when the mitt would be ready for regular play. Though most of the pure leather mitts need a certain break in time. You may buy a mitt made of softened leather if you need to use it quickly or else you may buy and start using the glove part time to allow it to break in before you actually start using it for a regular game. For the young players today, ease of use, long lasting and durable products and fast adjustability is all that is required. This Mizuno mitt works perfectly by providing the Power close mechanism that requires no extra effort to put on the glove easily. On the Mitt, there is a V-flex notch to support the easy and quick closure to stay precise for catching the ball. For shock absorption and keeping the palm safe, the Mitt is provided with the Parashock palm pad that offers great comfort and protection for the player’s hand. It is a 32.50 inches catcher’s mitt which would work best for young catchers aged 12 or more. It comes with closed webbing. There is no or little break in time required to your kid would not have any issues to start using it immediately. Wilson offers some of the finest mitts for baseball catchers. This one is a great youth baseball catcher ‘s mitt that has the circumference of around 32 inches so it would be perfect for kids having the age of 12 years or below. The mitt is perfect for young players as it is made with full grain leather having no break in time and come game ready for the convenience and satisfaction of young players. Further, it is lightweight and the catchers can use it easily. To protect the palm and form a durable pocket, there is a dual construction to make sure the catcher stays safe. This one has the H-web and dual welting to provide better pocket and durable structure for better catching and long lasting performance. Available in both left and right-hand orientation. Akadema offers perfectly structured youth catcher’s mitts with lots of beneficial features to keep you kid play safe and comfortable. This one is a 32-inch glove that is inspired by the praying mantis design. The webbing is made with spiral lock design and it comes with open back to offer more customizable fit and also make sure the catcher can maneuver the hand direction easily. Further, the deep padded pocket offers high-quality comfort and easy catching without losing control in any condition. The glove is available in right and left-hand orientation. It has been designed by the Hall of Famer Gary Carter and come with a stress wedge tech located between the index finger and the thumb to absorb the pressure and ensure the catch is perfect. The pocket is made with high-quality steer hide and akademalyte leather on the back offering a durable structure. There are two well designed and dwell-placed finger hammocks to make sure the fingers are placed correctly. Further, the slim double sided padding ensure improved pocket size and comfortable fit to the catcher’s hand. The mitt is available for left and right-hand orientation. For a game ready comfortable mitt, this Rawlings Renegade Series works best. This is a 31.5 inches mitt that offers one piece web and Fastback design for a sturdy and durable structure to help catch the ball without getting hurt. The out shell is made of full grain leather for high-level durability whereas the pocket is deep and is padded enough to provide absorption for the shock impact when catching the ball. The mitts work for both hard and softball game. It is available for right and left-hand throw. The Velcro tapes help in adjusting the mitt size to keep it snug fit with the wrist for better performance. The Rawlings mitts are always of good quality and so is this one. This is a 31.5-inch circumference Mitt offering a closed web structure for better catching capability. The pocket has enough padding to absorb the shock of the ball. The upper shell is made with stiff leather and the glove also needs some time to break in and is not game ready when you get it. Overall the design and fit are perfect. If you could give it some extra time to break n, it would go easy later on. It is durable and long lasting and perfect for kids. 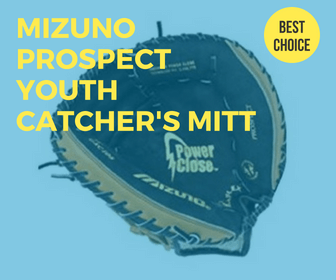 The Mizuno Prospect Youth fastpitch catcher’s mitt has the best mechanism for catching action supported by a V-flex notch for easy closure and power close tech for closing the glove as instantly as possible. The Parashock palm formation gives enough shock absorption and comfort while playing. ​To make sure the mitt fits and stay on the hand the Powerlock tech helps in fitting the mitt perfectly. This mitt has 32.5 inches circumference and gives enough room for a kid’s hand. The Mitt is available in left and right-hand orientation so you have to choose your preferred one. The first thing you need to be sure about is the kind of mitt you need. Most of the catcher’s mitts come with a closed pocket design to make sure the catcher can catch up the ball easily. Open mitts can be sued if you are using bigger sized mitts. Further, you may need to select if you need to be closed back Mitt or open back Mitt. Closed back Mitt offers stability and support whereas the open back offers easy movement of the hand and slight adjustability of glove size. Make sure to choose the right material. It is better to choose steer hide or pigskin mitts as they are sturdy and would not be worn out easily. Flimsy materials may cause injuries. The padding on the Mitt matters a lot. So, make sure to select the one having enough padding to give your kid safety. Choose a perfect fit or an appropriate size so that it will allow your kid to manage the catch and throw mechanism easily. Mostly a size range from 30-32.5 would be the best one as a youth catcher’s mitt. Concluding our discussion regarding the best youth catcher’s mitt, we can say that having a high-quality leather mitt with closed deep pocket design, stiff back, and the heavy padded palm is necessary for having a safe and easy game. You can find an easy break in mitts in case your kid has to start using it immediately otherwise if your kid has some time, you should prefer buying a pigskin leather mitt which is sturdier and safer for kids and durable as well.